The WorkCast Platform, as well as running live events, also allows you to run Scheduled Replay (Simulive) events. These events use pre-recorded media to play out to the audience at a scheduled time. As such, they are set up as though they are a 'live event' but without the need for any interaction at point of broadcast from the event organiser or presenters. Who can create a Scheduled Replay? Producer user types have access to create a scheduled replay, Host user types do not have this option available to them. The recorded media (MP4) must be available within your account to be able to attach to your event. IMPORTANT: Please ensure your media uses the following settings. mp4 h.264 using profile "Baseline"
The length of media must be a minimum of 1 minute and a maximum of 3 hours. The WorkCast Platform will not display media outside of these requirements as options to attach to your event. The duration of the event will be dictated by the length of your attached media; if you schedule a live event with a 1 hour duration and attach a 42 minute piece of media, the event will run for 42 minutes. Can I use the Phone Bridge? You have the option to dial-in to the phone bridge during the schedule replay broadcast to speak over the media live. Please note you will only be able to speak up to the length of the media - so if your media is 42 minutes and you want to dial in to the phone bridge to do a live Q&A it would need to take place within those 42 minutes. Alternatively, when you create your media, you can allow an extended section containing no audio where you will be able to dial-in and speak to your audience. You can preview your media within the WorkCast studio prior to your event. Please note: Preview is only available prior to the event up until the length of the media plus 15 minutes. For example, if the media is 30 minutes long, the last point you can preview the media in the Media Hub is 45 minutes prior to the event start time. The preview will display inside the Media Hub for presenters and will also broadcast to your audience in the main event landing page. We would recommend that you preview your media from end to end. Once your is media attached, the event will begin at the start time you have set. The stream may start within 90 seconds prior of the start time to ensure the best attendee joining experience. The 'Auto On Demand' option after the event has successfully completed . Your event listing page and individual event page will indicate this is now available. You may experience up to an additional 60 seconds added to the end of the On Demand version of your recording. This can be trimmed, should you require, by navigating to Media within your account, selecting the On Demand piece of media and clicking 'Trim'. You can configure polls to appear for your scheduled replay event prior to your event taking place. IMPORTANT: Polls will not automatically be pushed to your audience at pre-configured times; you MUST manually trigger polls from the WorkCast Studio during the time your event is broadcasting live. Simply follow the steps below to create a Scheduled Replay event. 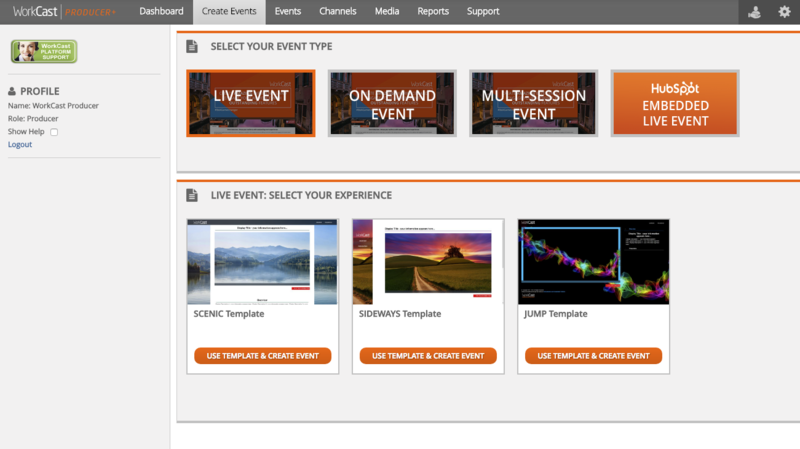 Create a Live Event from the 'Create Events' tab within your account. Set a date, time and duration and click 'proceed'. You should now see the 'Slides' tab has changed to 'Media'. A holding piece of media is attached by default. You are then able to select the 'Choose Existing' button underneath the holding media to attach your desired piece of media. If you do not see a 'Choose Existing' option then there is no MP4 media available within your account. Once you have attached your media hit 'Publish Draft'. You can now hit the 'Run Event' button to launch the WorkCast Studio. The Media Hub tab will show you a count down clock until the event begins. If you are within the available preview time you can hit 'Preview' to see your media play. This will broadcast in the Media Hub and on the event's Auditorium page. If you choose to preview your media we advise to lock your Auditorium temporarily until you have completed the preview process. This prevents any viewers who may be visiting your auditorium page at that time from seeing your broadcast content. To do this, visit the 'Auditorium Interactions' module within the WorkCast Studio. Be sure to unlock the Auditorium once complete so viewers can access the page on the the broadcast date. Please note: Locking an Auditorium will not work if you are embedding your media into HubSpot or your own website. Please bear this in mind when previewing the media on embedded events. The scheduled event date, time and duration are correct. The correct piece of media is attached to the event (especially if multiple different edits have been uploaded). Any polls have been added to the event ready to be pushed out during the live event (added via Extras tab). The draft of your event has been published. The auditorium has been unlocked if previously locked. Your event will now be broadcast within your auditorium page at the scheduled start time.